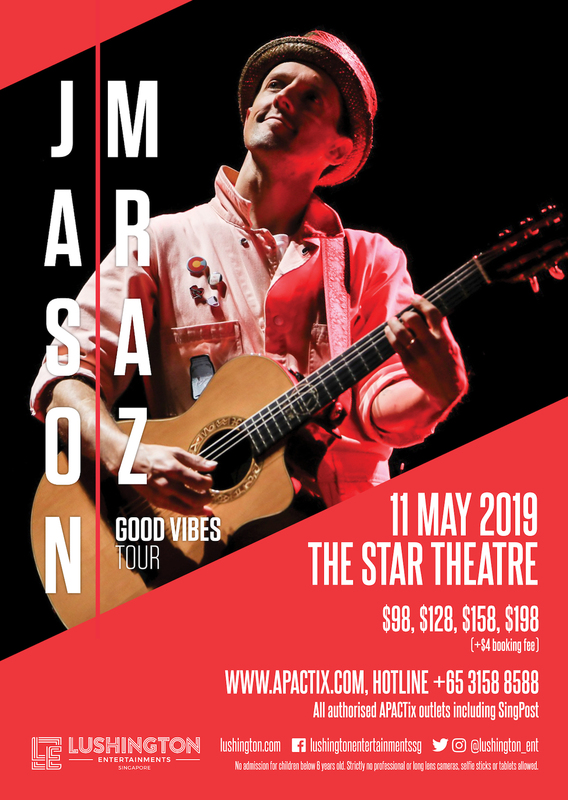 Multiple GRAMMY® Award winner JASON MRAZ will be bringing his Good Vibes Tour back to Singapore, on 11 May (Sat), 8pm at The Star Theatre, The Star Performing Arts Centre. Tickets from S$98 will be on sale on 9 Nov (Fri), 10 am via www.apactix.com, hotline +65 3158 8588, Box Office at Singapore Indoor Stadium, The Star Performing Arts Centre Box Office, Scotts Square Concierge Desk and all SingPost outlets. Artist fan club members and Lushington mailing list subscribers will be able to purchase pre-sale tickets from 6 November, 10am to 7 November 11:59pm. For Lushington membership sign-up, please visit www.lushington.com/subscribe. Jason Mraz has amassed a diverse fan-base around the globe, bringing his positive message and folk-pop sound to rapt audiences through his vibrant recordings, humorous live performances, and philanthropic efforts. Along the way, he has earned numerous platinum certifications for his various releases, made pop history with his record-breaking singles, “I’m Yours” and “I Won’t Give Up”, won two Grammy Awards, received the prestigious Songwriter Hall of Fame Hal David Award, and sold out amphitheatres and arenas across the globe (including sell-outs at The Hollywood Bowl, Madison Square Garden, and London’s O2 Arena). A dedicated artist and gentleman farmer, Mraz is first and foremost a committed global citizen. His impassioned social activism and philanthropic efforts span from environmental advocacy to ardent support for human rights. His own Jason Mraz Foundation serves to shine for arts education and the advancement of equality. Through it all, Jason Mraz continually confirms and celebrates music’s myriad forms and miraculous power, inspiring and delighting his countless fans around the world. The tour announcement follows the release of Jason’s sixth studio album Know. on August 10th, becoming his fifth consecutive studio album to debut in the Top 10 of the Billboard 200. ‘Have it All,’ the first single lifted from Know peaked at #1 on iTunes in various territories including Hong Kong, Taiwan, Singapore, Malaysia, Philippines, Indonesia, and Thailand. Taiwan had 8x #1 with Know. on release across all partners including Apple Music, iTunes and KKBox. No admission for children aged below 6 years old. Tickets available from www.apactix.com, hotline +65 3158 8588, Box Office at Singapore Indoor Stadium, The Star Performing Arts Centre Box Office, Scotts Square Concierge Desk and all SingPost outlets.